It is ours. It is the only one we have. It is limited and precious and full of surprises and letdowns and joy and sorrow. When you go along with life, it’s easy to forget you have it. It’s easy to forget what you have in it… because it’s always there and you take it for granted. You just look at the things you are missing in your life, not the things that could be missing… that are instead right there in front of you. I’ve been in a bit of a funk lately. I think it’s a combination of losing yet another offer on place. On getting a year older soon, and maybe a year wiser, but not being sure if I’m a year better than I was. Tragedies that happen in life bring perspective- as they did for me this week. People who had been training to qualify, then actually running the Boston Marathon, their families and friends, lost lives, lost limbs… people lost so much that I’m sure they never really thought they would ever lose. It all creates perspective for the rest of us who were not there…. that I’m here. I’m here now. My troubles, although bothersome, are just that… bothersome. The important things… my family and friends, my health… is all here. And I have both my legs. So, I hate running. Seriously dislike. It was by coincidence I went for my first run in a very very long time on Sunday. I think I would have stopped there… but after hearing about the news in Boston, I ran again the next day. And again. Let me be honest with you… I still hate running. I just don’t get it. Sorry, runners. However, I’ve been wanting to run for a while… or something. I knew that part of my quest of lowering my cholesterol (and not being winded in life) would involve some sort of regular cardiovascular activity. I have always planned on it. I just realized this week… I have this. Now. I am healthy and have two working legs- which some of these people no longer have as of Monday- and I should start using them, and appreciating them. So I run. Not very far, not for very long. I had to start somewhere. I’m still doing yoga. I am trying. I’m trying to take advantage of those things I have that I’ve forgotten that I do have because I’ve been so caught up in things I don’t. 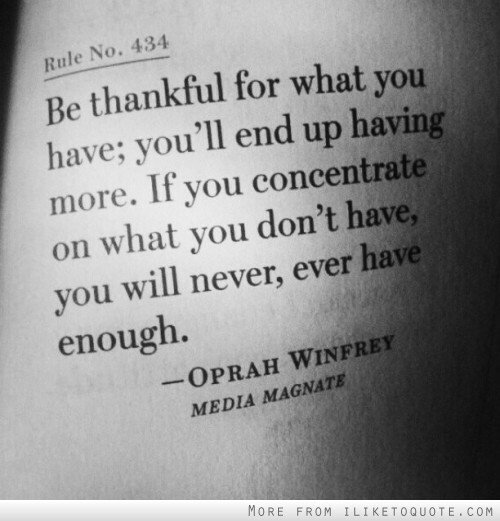 Be thankful for what you have. Be aware of what you have. You never know what’s around the corner. Appreciate what you have today, and use it!